'Magic,' Bruce Springsteen's new studio recording and his first with the E Street Band in five years, is set for release by Columbia Records on October 2, 2007. 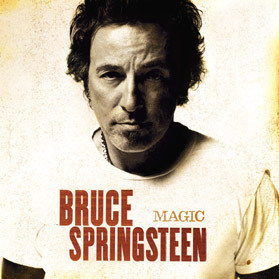 Produced and mixed by Brendan O'Brien, the album features eleven new Springsteen songs and was recorded at Southern Tracks Recording Studio in Atlanta, GA.
'Magic' is the first new studio album by Bruce Springsteen and the E Street Band since 2002's GRAMMY Award-winning, multi-platinum, number one album 'The Rising' (Columbia Records), which was also produced by O'Brien. Bruce Springsteen's longtime manager Jon Landau said, "'Magic' is a high energy rock CD. It's light on its feet, incredibly well played by Bruce and the members of the E Street Band, and, as always, has plenty to say. It's also immensely entertaining. 'Magic' is the third collaboration between Bruce and Brendan O'Brien and is a culmination of their very productive creative relationship."